©2012 R.L. 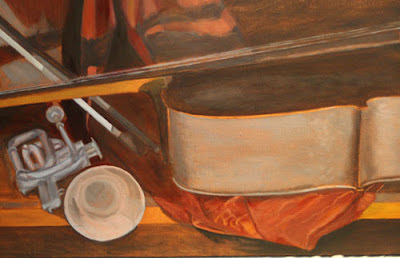 Delight, "Duet" oil on linen, 22"x40". Work in progress. © 2012 R.L. Delight, "Duet" work in progress close up. I had a bit of a challenge getting a good shot even taking it off the easel. There is a bit of glare on the painting. There is a call for art I would like to do a painting for and suddenly I realized I need to get going on it if I am going to make the deadline. The show is at the gallery where I volunteer as a docent. The painting above does not have any deadline and I am feeling I need to step away for a week or two. Not only do I need to refresh my vision for the painting but some of the paint needs to dry a bit before I oil out the painting to get a better idea of what the tones are doing. 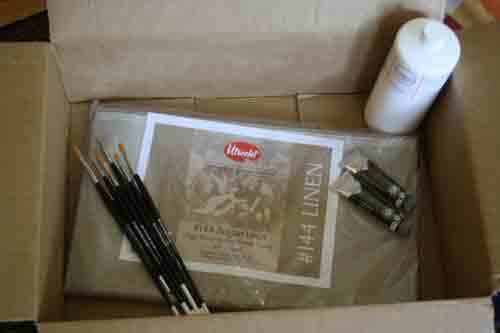 With the new painting in mind I got a few art supplies ordered. My mate made me another stretcher bar frame and I ordered linen and sizing. I also ordered some different brushes to try and two new colors to add to my plein air and seascape painting palette. I am trying Rembrandt brand greenish umber and green earth. 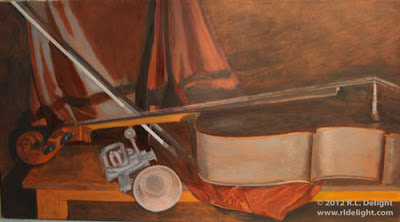 The next painting will have a seascape in it as well as a still life of sorts. Notice I say "ordered"? Living in a relatively isolated area means most of my supplies are ordered online. This week I will be busy stretching canvas, getting a few paintings framed and ready to submit to a local art show, and working on compositions. Evenings and weekends will be spent playing music with Sedona Fire and practicing my cello. It makes for a lovely full life! OMGosh, that painting is coming to life. It looks to me like you've gotten a ton done on it. I know what you mean about summer. So many things to chose from to do and at least here, we've had a pretty nice cool summer so far.